A father used his mobile phone to film up young schoolgirls’ skirts as they queued up at McDonalds. Another customer at the restaurant alerted police and officers tracked Omar Hayes down via an appeal on Facebook. Hayes, a 35-year-old former shopworker, now unemployed, of St Andrews Gate, St Annes, pleaded guilty to an offence of outraging public decency and possessing cannabis with intent to supply the drugs. Martine Connah, prosecuting, said a man at McDonalds, Bank Hey Street, Blackpool, alerted police after seeing Hayes using his mobile phone to film up the skirts of four 13-year-old girls in the queue in front of him on April 5 at 4.30pm. Police obtained a still photograph of Hayes from the restaurant’s CCTV and used it to trace him via social media. Officers searched his home and found 85 wraps of cannabis on the kitchen worktop. When interviewed, Hayes said he had no ideal why he had filmed the schoolgirls as he had no sexual attraction to them. He added that he was a father and also had a partner. He said he had looked at the videos but they did not show under the girls’ skirts and he had deleted the footage. Hugh Pond, defending, said Hayes had been frank with police and admitted briefly trying to film under the girls’ skirts. He was totally contrite and could not explain why he had done it. Hayes was a long-standing cannabis user and the majority of the cannabis was for him, but he admitted intending to sell some of it to pay for his own habit. 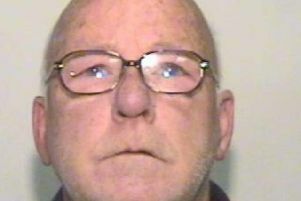 Hayes was bailed to appear for sentence on November 2 at Preston Crown Court by Blackpool magistrates.